Nick Bonomo seems to be on a mission to get a clean sweep of every uncommon gull possible in the North East this winter. He spotted this probable adult Common Gull at Bradley Point this morning in West Haven and although I have seen a thousand of these in the UK I thought it would be fun to pop along and see one in comparisson with some Ring-billeds. 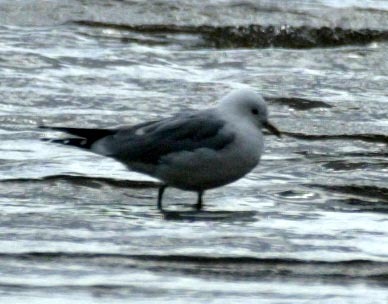 The obvious field marks in my lousy record shot are this birds dark eye and the slender, smaller, fairly lightly marked bill. In the field it looked slightly smaller than surrounding Ring-billeds and to me the legs seemed pretty green toned. In some guides this bird will be illustrated as Mew Gull however it seems that the initial thoughts are that this is more likely that this bird is the European subspecies on this bird Larus canus canus as opposed to the North American subspecies Larus canus brachyrhynchus, but I’m sure better pictures and notes from the field will confirm one way of the other. One of the keys is in the primary pattern in flight or with stretched wings which I must admit I didn’t observe well enough. Cool bird Nick, thanks for the phone call. EDIT: More and much better pictures online on Nick’s blog (here). Mark Szantyr also posted his pictures online now (here).